Harry Schoenberg, Mackenzie-Papineau Battalion, December 1937. 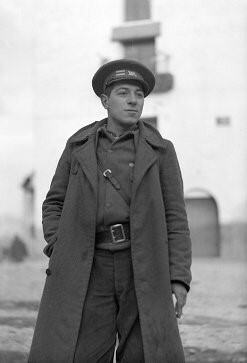 The 15th International Brigade Photographic Unit Photograph Collection; ALBA Photo 11; ALBA Photo number 11-1285. Editor’s note: At the initiative of ALBA board member Chris Brooks, who maintains the online biographical database of US volunteers in Spain, the ALBA blog will be regularly posting interesting articles from historical issues of The Volunteer, annotated by Chris. This week, Saul Friedberg sketches a memory of Harry Schoenberg, his traveling companion and comrade in the Mackenzie-Papineau Battalion. Memory, even memory of the recent past, plays surprising tricks, and memory of events 50 years old must be unreliable. However, my memories of Spain seem to persist with a surprising vividness and detail. So, acknowledging the possibility of error, I will briefly recount my memories of a few events connected with Harry during the Spain years. Harry left for Spain from Chicago in early 1937. He and I, with a few others went by Greyhound to New York, stayed at the Y on West 34th Street, attended serious and purposeful meetings in a dingy second floor office in a building on lower Second Avenue, sailed across the ocean together to Le Havre, went through Paris, Ales, and Beziers to Perpignan, climbed over the Pyrenees on dark night, arriving in Figueras at daybreak, made our way to Albacete, and then ended up in Tarazona de la Mancha, where we became original founding members of the MacPaps. We were in the MacPaps at Teruel. On the final day of destruction of MacPap Third Company, which was on the extreme right flank of the Battalion, a small group of us – three or four men – under Harry’s command were sent, by Saul Wellman, to make our way to the beleaguered Third Company. I still cannot imagine, and I did not know then, what our mission was supposed to be. To set the stage, for four days or so before we started out on our mission, our right flank had been a Hell of artillery and air bombardment, interspersed with infantry attacks. The hills occupied by the Spaniards on our right and by the Third Company disappeared in the clouds of dust and smoke thrown up by the bombardment, and the roar of the attack was incessant. So we had good psychological preparation for our mission, and our courage was well screwed up, and I don’t mean mixed up. When we got to the base of the Third Company hill we were met with a barrage of shells bursting in air, raining screaming shrapnel down on us. At the same time, the route up the hill was kept under constant fascist machine gun fire. They were in effect behind us and could see everything we were doing. There were some small shepherd’s huts at the spot we were, stone huts, with stone roofs and we dived for cover into them. From where we were we could see the survivors of the Third Company trying to make their way down the hill and to the rear, and most of those we saw were cut to pieces before our eyes. Harry, our leader, was dressed that day in full uniform, every button buttoned, and, believe it or not, he carried a swagger stick, picked from a tree no doubt, but definitely a swagger stick, and Harry picked a spot that seemed to be free of fire and, disdaining cover, swaggered about with his swagger stick surveying the situation as a commander should, no doubt trying to figure a way to complete our mission. Ultimately we were forced to beat a retreat back to Sauly’s viaduct under the railroad tracks. The picture of Harry fearlessly strolling in the open, unmoved by shot and shell, determined to do his duty, has remained vividly in my mind ever since, and I offer my tribute to him for his courage and gallantry. Those of us still alive have witnessed 75 years of the heroism of millions fighting for justice and freedom, so we are not unique. But nevertheless let us pay tribute to our own. Nice homage to Harry Schonberg. There is a nice photo of Harry, Bill Skinner, Sauly Wellman and Lou Bortz in Tamiment (ALBA Photo 11-0874). The photo was taken after Teruel and probably was at the point where they were awarded commendations for bravery in action.